Dog bites can result in serious injury or even death. When the dog owner fails to exercise due care to protect others from his or her dog, a dog bite personal injury case can arise. 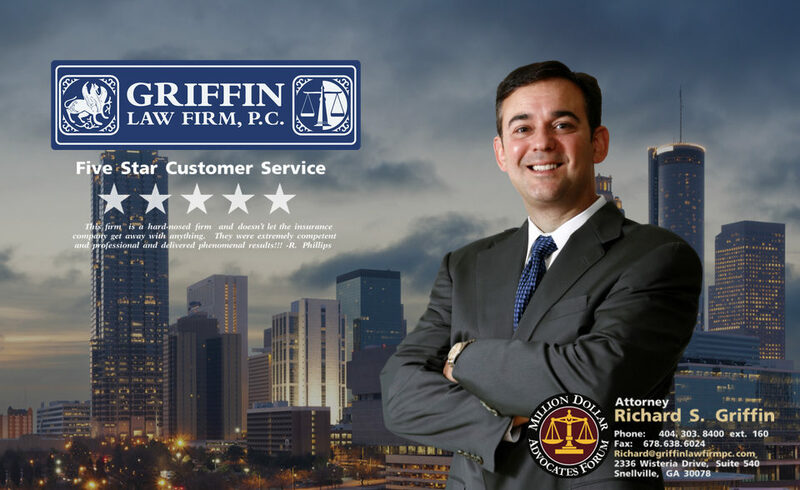 Attorney Richard Griffin and the Griffin Law Firm has vast experience handling dog bite personal injury claims. Because the injuries, scarring, and disfigurement can be so severe and the medical bills so extensive, these claims can result in very larger personal injury settlements. We encourage you to call us today to discuss the facts surrounding your dog attack case at 877-PAIN-LAW or 877-724-6529. History of Dog Attacks: Liability is much easier to establish when the dog has a history of biting or attacking. This means that the owner was on notice that and knew that his or her dog has a propensity or natural tendancy to act aggressive. However, if the dog attack is the first time this dog has bitten someone, then the insurance company and their defense attorneys often raise the “one free bite” defense and deny the dog bite personal injury claim. Attorney Richard Griffin has successfully overcome this defense when the dog wasn’t leashed or fenced as required by Georgia law. Unleashed or Unfenced Dogs: The dog owner can also be held liable for the dog attack or dog bite if the dog is running loose without a leash or if the dog is not properly restrained by a fence or other proper restraint. Dog bites often occur when the dog is roaming a park or neighborhood without proper restraint. Often this can result in a dog attacking a child, an adult, or another dog. What damages can you recover in dog bite personal injury claims? Medical Treatment Costs: The personal injury claimant can recover for the cost of the medical treatment that is received. He or she can also recover for cost of the projected or recommended future treatment. Sometimes doctors will state that a future scar reduction surgery, skin graph, or other surgical procedure may be required in the future. Pain and Suffering and Loss of Enjoyment of Life: Pain and suffering is the money that a personal injury claimant can recover for the physical pain of the injuries, but it is not limited to only physical pain. You can also recover for the mental anguish, anxiety, stress, and inconvenience. Pain and suffering can be greatly increased if there are permanent scarring, disfigurement, or limitations that result from your dog attack or dog bite. Lost Income or Wages: Dog bite victims or dog attack victims can also recover in their personal injury claim for the lost wages that result from their injuries. These damages normally require the doctors to provide a work excuse that states the claimant cannot work due to his or her injuries and documentation from the claimant’s employer that verifies the dates missed from work and the total lost income that resulted. Punitive Damages: Punitive damages are allowed in dog bite and dog attack cases only if the dog owner has shown a reckless disregard for human life. These damages are allowed to deter or discourage the dog owner from dangerous and egregious conduct in the future. An example might be a dog owner that knowingly releases and commands the dog to attack someone who is innocent of any criminal conduct. Loss of Consortium Claim: The spouse of a personal injury claimant can recover for his or her loss of consortium claim. This claim derives from the spouses personal injury claim and is covered normally under the same policy limits covering the injured spouse. The damages in a loss of consortium claim include the loss of physical intimacy, companionship, household chores, and other negative impacts the injuries caused to the marriage of the injured party. What types of insurance policy normally covers dog bites or dog attacks? Normally personal injury claims from dog bites or dog attacks are covered by the dog owner’s homeowners insurance. The dog bite attorneys at the Griffin Law Firm know how to locate the insurance coverage, and how to verify the insurance policies. This is very important when determining how much you can recover for your personal injury claim. Write down the dog owner’s name, address, and telephone number. Note a description of the dog that attack you. Ask the dog owner for the name of his homeowner’s insurance. Note the exact location of the dog attack. Write down the contact information for any witnesses to the dog bite. Call the police department and the nearest animal control center to report the dog bite. Seek the medical treatment you need. Call the Griffin Law Firm so we can guide you through the personal injury claims process to make sure you are fully compensated for your claim. Free Dog Bite Consultation: Attorney Richard Griffin and his Atlanta dog bite lawyers are here to give you the information you need for free. We can also explain why it is so important to hire an experienced dog bite attorney to verify all of the insurance policies that cover your claim, to help you get the medical treatment you need, and to negotiate the great personal injury settlement that you need and deserve. Phone Consultation: Call us today at 877-PAIN-LAW or at 877-529-7070.